The ASA National Tour had a slogan; “We Build Champions.” The ASA career of Bryan Reffner was a good example of that. In 2005, he is on the outside looking in. It’s widely known that financial troubles caused ASA to close shop over the off-season and the powerhouse short track series that once was is no more – at least for the time being. That has left one of the drivers who has defined the tour in the past decade without a racing home. Bryan Reffner is looking ahead to see what is next in his racing career. In 1994, Reffner fought a close battle for Rookie of the Year honors with Dave Sensiba. At the end of the season, Sensiba edged Reffner for that, but Reffner got the last laugh one year later when he won the ASA championship. 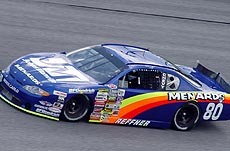 After that, Reffner went on to spend time in the NASCAR Craftsman Truck Series with success. He won a race, several poles and finished in the top ten of the point standings twice. He was also the series’ first ever Rookie of the Year. Then, Reffner found himself back where it all started; back in ASA. 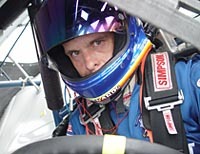 He ran a limited schedule for Country Joe Racing in 2002 before competing with his own team. Last year, he finished third in points. “We don’t have anything set for this year yet,” said Reffner not long ago from his Wisconsin shop. 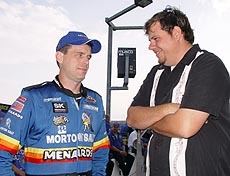 For someone who aspired to be an ASA driver while coming up through the racing ranks, that is a tough pill to swallow. Reffner ran the colorful #80 in ASA. announced plans to use the rules and specs of the ASA National Tour to put on a race series in 2005. Against all odds, the group led by Wisconsin businessman Gary Vercauteren have put together a race series in a short amount of time and will start their season on April 30th. This gives teams like Reffner’s an opportunity to race again. Reffner has registered for the series, but he isn’t 100-percent sure he’ll be able to make it to the party. starts in late April, he will find a way to be there. Especially considering how pumped up he was after making a late season run at the ASA championship. Reffner chats with Speed51's Matt Dillner. “Every part of me wants to be there for opening day,” said Reffner. “But it still has to make sense dollar wise for me to do it. “In a non-televised series, it’s tough to go out and get the sponsorship money to operate. But don’t get him wrong. Reffner is a big supporter of the ASL concept. Over the off season, Reffner looked at various racing options and it was hard to find a perfect match for driver, series, team and sponsor. 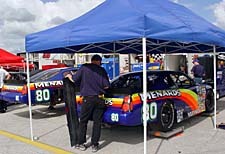 The Menards team needs to stay in the Midwest to promote their sponsor. Reffner knows that he will be racing somewhere this year, but he just isn’t sure where that will be. But when it comes down to it, this is a driver who isn’t concerned with turning heads or making headlines. He just wants to race and come away from each track with the best results possible. Climbing the ladder of motorsports isn’t what is on his mind anymore. “In racing terms these days, if you’ve had your 20th birthday than you are getting too old to move up,” said Reffner.